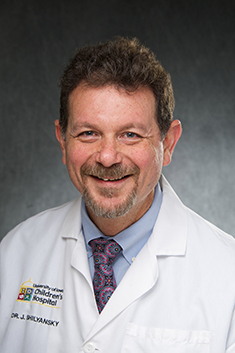 Joel Shilyansky, MD, is the Robert and Hélène Soper Chair of Pediatric Surgery and surgeon-in-chief for University of Iowa Stead Family Children’s Hospital. He earned his medical degree from the University of California at Los Angeles and completed his residency at the University of Michigan Medical Center. He did a fellowship in surgical oncology at the National Institutes of Health in Bethesda, Maryland, and a fellowship in pediatric surgery at University of Toronto’s Hospital for Sick Children. His research focuses on the immune response in pediatric cancer patients, and additional studies in his laboratory relate to cancer vaccine development. Why did you decide to be a physician? Both of my parents, my aunt, and my sister are doctors. My grandmother was a nurse. It wasn’t expected necessarily, but I did get to know quite a bit about the process. Medicine is something I found fascinating, interesting, and exciting. Being a doctor provided me with an opportunity to serve the community and the people around me, and that’s always been important to me. I’ve always liked kids. During my freshman year of college at the University of Michigan, I volunteered at a children’s hospital in Ann Arbor. Kids are fun, exuberant, and have excitement for life. They are also very brave. It’s been inspiring. With pediatric surgery, you must be very proactive. It involves being thoughtful. You make decisions, and you execute them, and you don’t get to ‘wait and see’ too much. But you also get to see the results of what you do—sometimes very quickly and very dramatically. What attracted you to UI Stead Family Children’s Hospital? I trained with another pediatric surgeon who completed his residency at University of Iowa and served as director of pediatric surgery at one point. I knew that Iowa was an outstanding university, and there was a really strong tradition of excellence in pediatric surgery. In Iowa I had the opportunity to build the division of pediatric surgery and add to that tradition. Most importantly I have really good colleagues and that makes work fun. What is the role of a pediatric surgeon? We are experts in a number of different areas. Newborn anomalies are probably the most unique thing we treat. Because we deal with many rare things at UI Stead Family Children’s Hospital, we have to have expertise in many different areas. We focus on the unique physiology of children. There are certain categories [of conditions] that we treat: children’s cancer, neonatal malformations including those of the lungs and GI tract, and problems of the liver bile ducts. Our standard approach to gastroschisis is slowly becoming the standard around the country. [Gastroschisis is a birth defect of the abdominal muscles that causes a baby’s intestines, and sometimes other organs, to stick outside of the body through a hole near the belly button.] UI Stead Family Children’s Hospital has always been known for our treatment of esophageal malformations. Our pediatric surgeons perform emergency and trauma surgery and participate in the care of children requiring extracorporeal membrane oxygenation (ECMO). We perform GI surgery, such as treatment of inflammatory bowel disease, and we work with pulmonary doctors on lung malformations and airway problems. One of the things that allows us to be experts in a number of areas is working together and listening together. That’s why I came here and that’s why I stay. I get to work with really smart, really good people. Your job must be rewarding. The job is incredible. It’s an opportunity to serve your community. Patients send us pictures on their birthdays and special occasions to remind us of what we do and why we do it. Some come back to visit us. Sometimes we can’t make everything right [by healing a patient]. Even when we can’t, we develop a wonderful relationship with patients and families and even sometimes those relationships last beyond when a child passes away. It’s just an excellent environment for patient care and work because of the expertise and dedication of employees at all levels of care, from the people who clean the rooms to nurses and doctors and others. They are all doing the right thing for the patients. I was just talking to one of my patients who doesn’t want to leave. Despite going through surgery and pain, she wants to hang out because of the environment here. The children’s hospital has a great vibe. What are you looking forward to about the new hospital? It will have all the new technologies, will be state-of-the-art, and the whole team will be together. More importantly, it will allow us to focus on children and families. We are creating an environment that is child-specific and will have things that fit the size of kids, their personalities, and their needs. It is going to be a really cool place. What else should people know about our new hospital? We are building a progressive children’s hospital for all Iowans and even children beyond Iowa. It’s here to serve everybody, and we work with community partners to provide surgical care to patients throughout the state to give children the best chance of recovery, so they can lead productive, healthy, and happy lives now and in the future. Being sick is no fun, but we work very hard to try to make recovery a good experience.